Cherry and dark chocolate just works so well together – the rich bitter cacao and the tangy cherries are a combination made in heaven. These healthy 3 ingredient treats are full of nutrition without any added sugar! 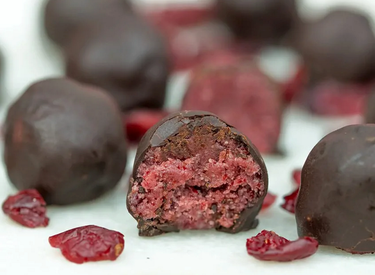 A cherry almond healthy filling is covered in chocolate to make a bliss ball that is free of coconut and dates. Suitable for vegan, paleo, gluten free, refined sugar free and whole food plant based diets.